Mr. Donnelly graduated with honors from Northeastern University, College of Criminal Justice, in 1973 where he was the recipient of the Alumni Award for Professional Promise. Mr. Donnelly served his country in the United States Army as a military policeman in Europe. He was honorably discharged in 1976, and is a Vietnam-era Veteran and is a life member of the Disabled American Veterans. 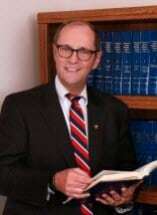 Mr. Donnelly attended Suffolk University Law School in Boston, Massachusetts, and graduated with honors in 1980. He was admitted to practice law in the state of Florida in September of 1980, and has been admitted to practice law in the United States Federal District Court, Middle District of the State of Florida, and the United States Supreme Court. The Law Offices of Thomas J. Donnelly was formed on October 1, 1980. It has been involved in general practice since that time with an emphasis on family law, criminal defense, commercial litigation and personal injury. Mr. Donnelly has litigation experience in family law, criminal, and general civil litigation in County, Circuit and Federal District Court. He has litigated in all areas of family law, including alimony and child support, equitable distribution, and all child related issues. He has represented individuals in the criminal defense area with charges ranging from Reckless Driving through First Degree Murder. His murder cases include State of Florida vs. Derrick Tyrone Smith, State of Florida vs. Clinton Lamar Jackson, State of Florida vs. Felita Robinson, State of Florida vs. Bobby Brown, State of Florida vs. John Schenk. He has also argued appeals before the Second District Court of Appeals and the Supreme Court of Florida. Mr. Donnelly was born in Fall River, Massachusetts. He has been married since 1987 to the former Patricia S. Zegers of Chicago, Illinois. Mrs. Donnelly holds her M.S.N. Degree and is the former Vice President of Nursing at St. Joseph's Hospital in Tampa. They have a blended family with four sons, Thomas Jr., Michael, Justin, and Ryan. Mr. Donnelly's past civilian employment experience includes the United States Air Force, United States Department of Justice, and the United States Department of Labor. He was a youth basketball coach and Little League baseball manager for over a decade. He is a member of Northwood Presbyterian Church where his duties have included teaching Sunday School.